Brilliant action game for two players. 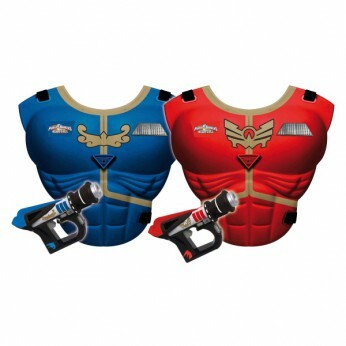 Includes 2 laser guns and 2 adjustable armour plates. Your weapon fires an infrared beam. If you hit the receiver on your opponents chest 6 times you win. With sound and light effects…. This toy costs approximately £34.99 (for the latest and best prices make sure you check our retailer list for the Power Rangers Mega Force Mega Laser Set above). In our review of Power Rangers Mega Force Mega Laser Set we classed it as being suitable for ages 6 years, 7 years, 8 years but recommend you check the manufacturer specific advice before purchasing.